Toyota's Corolla's "ears" (wing mirrors?) must be burning… Every manufacturer seems to be gunning for a piece of its market share, and Fiat is next in line with this new Linea sedan. In a new segment for Fiat SA, the Italians are introducing the stylish sedan into the C segment where it hopes to capture some of the Japanese stalwart's thunder. It is a very attractive car with the protruding front end snapped from the stylish Grande Punto while the rear is a mix of sharp creases along the boot's mid-section especially, extending to the oversized light clusters. The newcomer comes to SA fitted with a 1.4-litre 16-valve engine producing 66 kW. A five-speed manual gearbox is standard. Only one model with one trim level (Emotion) is offered, although, based on demand, Fiat is open to introducing the award-winning 1.3-litre Multijet engine into the line-up as well as a more powerful petrol engine. For now though, buyers who are prepared to part with R175 000 for this baby will have access to a staggering level of standard specification. The only options are metallic exterior paint and leather upholstery. Along with a roomy cabin and boot and rear seats that fold forward when even more space is required, are a radio/CD player with MP3 function, Fiat's innovative plug-and-play Blue&Me multimedia interface and My Car that cleverly allows the driver to individualise his/her instrument panel settings are on the list, too. Climate control, electrochromatic rear view mirror and power mirrors with a demist function along with the "expected" power windows, power steering and central locking with an autolocking feature and a height adjustable driver's seat are all standard. ABS with EBD, dual airbags, Isofix mountings for the rear bench and follow-me-home lights all form part of Linea's safety arsenal. And, by first impressions, the car is solidly built and should prove robust. The cabin, which is offered with three colour choices, is spacious and instruments and switchgear are all logically arranged. Materials are pleasant to the touch and in line with the current Fiat offerings. For what it's worth, in this segment, fit and finish seems fair, too. Riding on the Grande Punto platform, it makes use of McPherson struts at the front axle and a semi-independent torsion beam arrangement at the rear. It does not sell itself as a dynamic marvel, but if ride comfort is something you treasure in a car, you are unlikely to be disappointed by this little sedan. 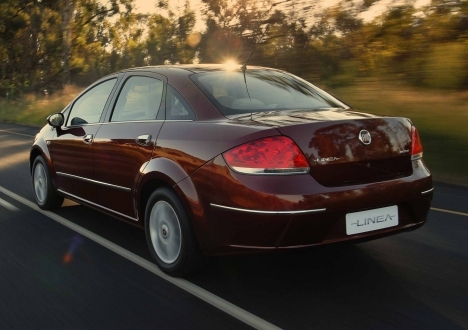 Linea is spacious too, with ample room for rear passengers and a boot that is positively huge. Fiat claims a maximum weight allowance of 500 kg, but this may make driving this sedan more laborious than it has to be. The car was launched in Durban where it performed adequately up to the national speed limit, although a few cog-switches were required for the longer hills. Top speed for this model is claimed as 165 km/h, but with a mere 66 kW and a paltry 115 Nm on tap, Linea will only get you anywhere in a hurry if you're prepared to mash the right pedal and listen to the laboured grunting of the 1.4-litre powerplant. If burdened with a load on the Highveld, the sedan's reluctance to "get moving" could score against it. Fuel consumption on the combined cycle is 7.8 l/100 km, while CO2 emissions are quoted at 168 g/km. Linea is built for right-hand drive markets at India's Ranjanaon plant, a facility that has been operational since 2008 and forms part of a joint venture with Tata Motors. Fiat SA is taking a stab at a key segment of the South African market. It hopes to snag a significant chunk of Toyota's Yaris and Corolla and Nissan Tiida sales (although the Volkswagen Polo sedan should probably be a consideration, too) while at the same time increasing the brand's awareness. Linea is a study in unbelievable bang for buck if you're not a hooligan and you don’t mind light-coloured interiors with a pile of Italian style. Whether the Toyota loyal and those disillusioned by Fiat's chequered past will be easily swayed, remains to be seen.